Fishing continued to be decent this past week but you definitely needed some luck on your side when it came to picking your locations. Last week on our guided trips and personal trips we fished Vancouver Harbour, multiple spots throughout Howe Sound, Coal Ports and Porlier. I feel like we got a pretty good sampling of what is going on out there and some spots were decent, others were very quiet, but none were what we would call on fire. Some of that slower action likely had to do with the full moon around the 23rd. Now that we have that out of the way, we expect things will pick up a bit more. In Vancouver Harbour it was relatively slow and there are lots of seals following you if you are fishing the West Van shoreline on the flood tide. That being said, we did see some pictures of nice fish taken in the freighters. This spot usually fishes best on the ebb tide, so keep that in mind if you are going to give the freighters a try. 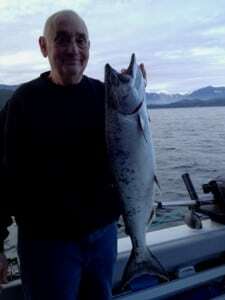 There were some nice fish taken in Howe Sound but it was pretty spotty with short windows of activity. We did manage a few nice fish on the tide changes. Eddies’ guest Ian with a chinook caught on the tide change this week. Coal Ports was pretty busy this weekend and for the most part it was slow. We knew a good number of the boats down there and it seemed most of them got one or none. 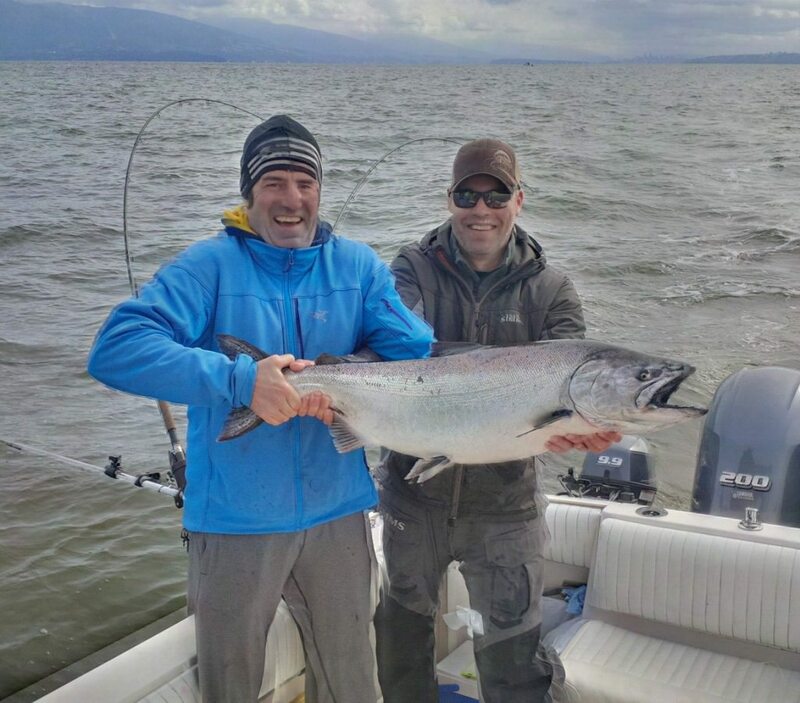 Jordan was fishing there on Sunday and they were one of the lucky boats and boated a nice chinook. I decided to take advantage of the sunny weather and flat calm seas on Sunday and head to Porlier with my guests. Unfortunately it was very slow. Not a lot of bait and only a few undersize fish to show for our efforts. Regardless of the lack of fish, the day on the water was as nice as it gets for this time of year. I have been over to Porlier a few times now and for the most part it has been relatively disappointing. There has been as good or better action closer to home. Porlier is usually pretty good this time of year, so of course this could change at any moment and we were also dealing with a full moon, but those are our observations so far. 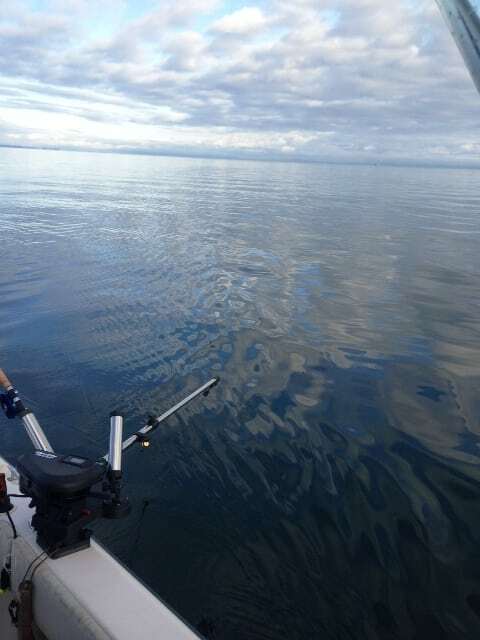 It was flat calm on Sunday at Porlier, but the fishing was flat as well! As far as productive gear goes, not much new to report. The usual glow flashers have been productive, like the Green Glow, Chartreuse Glow, Green Onion Glow and Purple Onion Glow. Spoons are the go to this time of year and the smaller Kingfisher 3.0 spoon in Irish Cream has been hot and honourable mention goes to the Homeland Security and Kitchen Sink. The Pesca spoons have also been very productive. We find they work especially well for winter chinook because we are fishing so deep and the Pesca spoons have such a strong glow. There were a number of fish taken this week on the Pesca spoons in the 3.5 and 2.5. Hot colours have been Uncle Bob, Gut Bomb and Leprechaun. Friend and Fellow Guide Greg caught two nice chinook taken this week on a chartreuse glow flasher and Pesca 3.5 spoon in the Uncle Bob colour.